We have the answer. If you don’t see your question, let us know. We’re here to help. 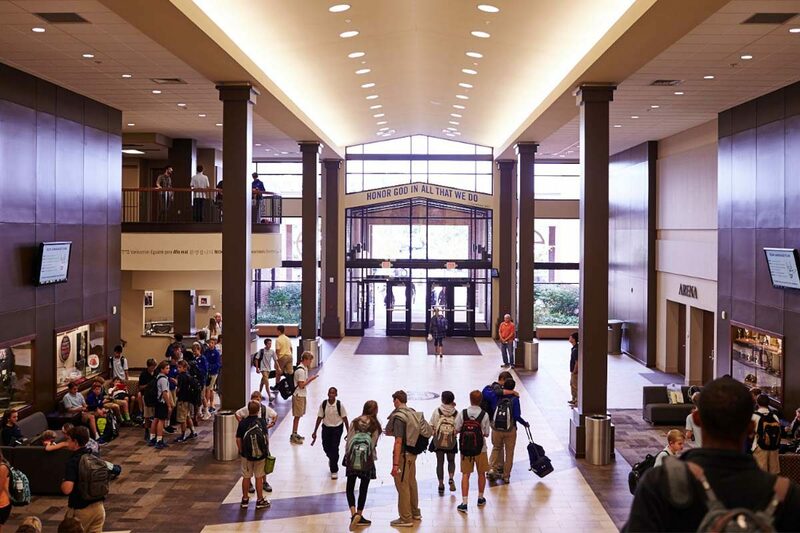 Westminster currently enrolls 970 students—260 in Middle School and 710 in Upper School. Our average class size is 17.3, and our teacher/student ratio is 1 to 11.2. Yes, Westminster is accredited by the Independent Schools Association of the Central States (ISACS). We maintain membership with the Independent Schools of St. Louis (ISSL), Christian Schools Association of St. Louis (CSASL), and The College Board. Westminster seeks to foster a community that embraces the cultural, ethnic, racial, denominational, and socioeconomic diversity reflected in our unity in Christ and the Kingdom of God. Westminster is comprised of people from differing cultural and ethnic backgrounds, but the school is also diverse in student learning styles, church denominations, and socioeconomic status. Our ethnic diversity is 19 percent, made up of African-American, Hispanic, Native American, Southeast Asian, multiracial, and international students. Our families attend more than 198 churches and represent many Christian denominations. Our comprehensive program provides for the educational needs of students with diagnosed learning disabilities and those who are academically gifted. More than 20 percent of our student body receives financial aid. Yes. The Westminster standardized dress program through Lands’ End and Global Schoolwear is simple, affordable, and includes a variety of options. What is Westminster looking for in a prospective student? Westminster seeks to enroll well-rounded students who are motivated to pursue higher education, grow in a personal faith in Jesus Christ, and serve others. We welcome students who represent a variety of ethnic, racial, and economic backgrounds. We encourage all applicants to apply online. If you have any additional questions about the application process, please email the admissions team or call 314.997.2900. Families need to complete both the parent and student applications. Our application fee is $50 and can be paid using a credit card during the online application process or by check mailed to Westminster Christian Academy. Can I schedule a visit and/or have my student attend a class? We encourage both parents and prospective students to visit Westminster and observe school in session. Parents are invited to one of our Welcome on Wednesday events scheduled throughout the school year. Student visitors are encouraged to join us on a Student Visit Day to attend classes, meet teachers, enjoy lunch, and tour the campus. You may also contact us by phone at 314.997.2900 or email to schedule a tour. Does Westminster require an entrance exam? Yes. Many data points are considered to form a complete picture of an applicant. An entrance exam is one of those data points. We accept SSAT or ISEE scores, but our preference is the ISEE exam; it allows us to measure a student’s progress from admission through corresponding ERB testing administered in grades 7–9. ISEE and SSAT scores, along with information from the student’s current school, may be used when considering a student’s course placement. Register online for one of the ISEE test dates: December 8, January 12, January 26, and February 23. What is the cost of tuition at Westminster? Tuition for the 2018–19 academic year is $17,350. Additional expenses may include school uniform, books, iPad (for incoming students grades 7–9), athletic uniforms, extra-curricular trips, retreats, and other school-related activities. Westminster does not participate in mandatory fundraising or giving. For more information about tuition, visit our Tuition and Affordability page. Does Westminster offer scholarships or financial aid? We offer financial aid to families on the basis of demonstrated financial need. Westminster awarded more than $1.5 million in need-based assistance for the 2018–19 academic year. Read more about financial aid at Westminster. I don’t think my family can afford Westminster and am not sure we will qualify for financial aid. What should we do? We encourage all interested families to go through the admission process. If you feel Westminster’s tuition and fees would be a financial hardship for your family, we recommend applying for financial aid and admission simultaneously. What happens to applicants when a grade is full? If an applicant is qualified to attend Westminster but there are no spaces currently available, the applicant’s name will be placed in a wait pool. If and when an opening becomes available, the Admissions Committee will select the most appropriate candidate for the opening. How does Westminster support the educational needs of students with diagnosed learning disabilities? Westminster’s Special Services program enhances a student’s academic success by providing tools and strategies to utilize in the classroom, with homework, and during testing. Special Services helps special learners to understand their learning profiles well enough to confidently adapt to a defined learning program. We limit this program to 10 percent of the students in a grade level. Does Westminster have a gifted program? The Gifted program at Westminster supports the educational and social-emotional needs of families with students identified as gifted. The Gifted program enhances academic potential and success by providing a compacted, enriched curriculum. Our gifted teachers help each student understand his or her learning profile and social-emotional needs while confidently seeking and managing academic coursework. This program will allow each student the academic challenge commensurate to his or her intellectual potential. Does the school offer Advanced Placement (AP) classes? Yes. We offer 19 distinct AP classes. Can my child play varsity sports as a freshman? Yes. Skill, not age, is most important. Junior varsity and freshman teams, as well as club sports, provide additional opportunities for athletic involvement. Does Westminster offer middle school sports teams? Yes. We encourage all middle school students to participate on sports teams. Students are placed on teams that are appropriate for their skill level. How are parents involved in the school community? Parents Advancing Westminster (PAW) offers many opportunities for parents to serve the Westminster community using their time and talents. We encourage parents to support their student by attending performances, athletic events, special on-campus programs, and other community events.